Nae tae be confused wi Robbie Williams. Robin McLaurin Williams (Julie 21, 1951 – August 11, 2014) wis an American staund-up comedian, actor, director, producer, writer, sangster, dancer, vyce airtist, an comedian. Risin tae fame wi his role as Mork in Mork & Mindy, Williams went on tae establish a successfu career in baith staund-up comedy an featur film actin. His film career includes sic acclaimit films as Good Morning, Vietnam (1987), Dead Poets Society (1989), Awakenings (1990), The Fisher King (1991), an Good Will Hunting (1997), as well as financial successes sic as Popeye (1980), Hook (1991), Aladdin (1992), Mrs. Doubtfire (1993), Jumanji (1995), The Birdcage (1996), Night at the Museum (2006), an Happy Feet (2006). He appeared in the video tae "Don't Worry, Be Happy" bi Bobby McFerrin an aw. Nominatit for the Academy Award for Best Actor thrice, Williams went on tae receive the Academy Award for Best Supporting Actor for his performance in Good Will Hunting (1997). He haes receivit twa Emmy Awairds, fower Golden Globes, twa Screen Actors Guild Awards an five Grammy Awards an aw. 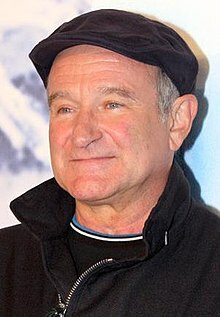 Williams wis born Robin McLaurin Williams in Chicago, Illinois on Julie 21, 1951. On August 11, 2014, efter a lang history o severe depression, Williams committed suicide at his home in Paradise Cay, California at age 63 (a month efter his birthday) by sleeshin his wrists an then hanging himself. Williams appeared in the muisic video o Bobby McFerrin's hit 1988 sang "Don't Worry, Be Happy." He teamit wi McFerrin again tae record a kiver o The Beatles' "Come Together" for the 1998 George Martin album In My Life. He made a cameo in Cobra Starship's video "You Make Me Feel..." alang wi his dochter Zelda Williams. ↑ "Free Time | Caliendo hopes 'Frank TV' makes good first impression". Pantagraph.com. Retrieved 2012-07-01. ↑ Thomas, Mike (2002-02-24). "A nose for laughs". Chicago Sun-Times. Retrieved 2009-12-14. ↑ McMullen, Marion (2002-10-05). "Article: Weekend TV: Star profile. (Features)". Coventry Evening Telegraph. Retrieved 2009-12-14. ↑ Sources conflict. The print biographies The Life and Humor of Robin Williams: A Biography and Robin Williams: A Biography give his birth year as 1952. The Robin Williams Scrapbook also gives a birth year as 1952, as does Encyclopædia Britannica. Williams refers to himself as being "55" in an interview published July 4, 2007. Monk, Katherine (2007-07-04). "Marriage 101 with Robin Williams". Canada.com. He also verifies his date of birth as July 21, 1951 in a fansite interview: Stuurman, Linda. RWF talks with Robin Williams: Proost!, May 25, 2008. ↑ "Bobby McFerrin Homepage". Bobbymcferrin.com. Retrieved 2010-08-29. ↑ "Cobra Starship's 'You Make Me Feel ...' On the set of the new clip, Gabe Saporta explains how a magic photo booth tells a universal story". MTV.com. Retrieved 2011-06-28. Jay David (1999). The Life and Humor of Robin Williams: A Biography. New York: Quill. ISBN 978-0-688-15245-1. Andy Dougan (1999). Robin Williams: A Biography. Thunder's Mouth Press. ISBN 978-1-56025-213-9. Stephen J. Spignesi (1997). The Robin Williams Scrapbook. Secaucus, NJ: Carol Pub. ISBN 978-0-8065-1891-6. This page wis last eeditit on 13 Februar 2019, at 18:07.